Since the initial announcement of the PlayStation 4 – and especially as Sony unveiled more and more of the ways its new home console would interact with its handheld one, the PlayStation Vita – speculation that Sony would inevitably bundle the two together. It seems that speculation was accurate, at least in some parts of the world. According to a report over at MCVUK, Sony already has plans to release a PS4/Vita bundle before the end of the year, before the new console is a full two months old. Billed as an “Ultimate Bundle,” the move is hardly surprising, considering the numerous ways the PS4 and the Vita interact and the amount of time Sony has spent touting that interaction since the PS4 was first unveiled in February. Additionally, VideoGamer.com has uncovered an image from an official advertisement, which you can see above. 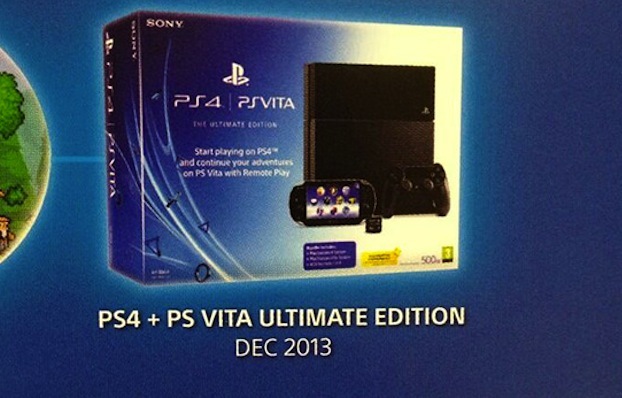 But there’s a catch – for now, at least, the bundle is only set to hit in the United Kingdom. It seems unlikely that Sony will pass on an opportunity to offer the bundle to the rest of the world – after all, there are certainly consumers out there who’ve sat out the Vita until now who’d jump at the chance to kill two birds with one stone – but for now its limited to the UK. Pricing information is also unknown, but it is confirmed to hit by the end of the year. What do you think, gamers? Is this bundle enough to convince you to move on a PS4? Are you kicking yourself for nabbing a system before this bundle was announced? Let us know in the comments.